The device is tasked with providing an entry-level tablet user with a selection of specs and features that push the usual expectations of a retailer-branded device. The Orange Tahiti, although finished with the Orange logo on the outside, is all Huawei on the inside, since it's manufactured by the Chinese budget smartphone specialist. Although the tablet scene has been pushed wholeheartedly in the direction of 10-inch devices, thanks largely to the unbridled success of the 9.7-inch Apple iPad 2, the Orange Tahiti has landed alongside a small collection of devices still trying to pioneer the success of 7-inch devices. Most network-branded smartphones and tablets are of the cheap and cheerful variety, often attempting to emulate the design or features of a higher-end model while adhering to a tight budget. But the Orange Tahiti moves beyond these price point limitations. It has an impressive array of specs capable of rivalling tablets made by more illustrious brands, such as the Samsung Galaxy Tab 8.9, HTC Flyer and BlackBerry PlayBook. A number of Android-based tablets still tout Google's smartphone-standard Android 2.3 Gingerbread operating system, while the Samsung Galaxy Tab 2 boasts Android 4.0 Ice Cream Sandwich. But the Orange Tahiti, like the 8.2-inch Motorola Xoom 2 Media Edition and Samsung Galaxy Tab 7.7, comes running the tablet-centric Android 3.2 Honeycomb. With a dual-core processor and dual cameras (5MP on the rear, VGA up front), Orange has covered all the bases for its first foray in to the tablet market. Seemingly cheap and cost-effective when taken at face value, the Orange Tahiti price is a stumbling block for such a small, albeit impressively specced device. While there are undoubted benefits to being able to fork out just £69 upfront in order to get your hands on the tablet, the 24 month, £25 per month contract adds a further £600 to the device's price in the long run. The other choice of paying nothing upfront, followed by £27 per month for 24 months, produces a slight saving, but is still expensive. Although these contracts will give you 1GB of inclusive anytime data, a further 1GB of quiet time data and unlimited access to BT's Openzone Wi-Fi infrastructure, the overall cost of the tablet will rocket to £669 or £648. This is almost £300 more than the basic Apple iPad 2 and £10 more (based on the higher price) than the highest specced 64GB Wi-Fi + 3G iPad 2 - figures that are hard to overlook. Despite a number of key players having moved away from the basic 7-inch tablet size, and with 7.7, 8.2 and 8.9-inch devices currently flooding the smaller tablet market, the Orange Tahiti has parked itself firmly in the market of the ultra-portable, just about pocket-manageable form factor. The Orange Tahiti boasts a highly desirable finish, with brushed aluminium casing stylishly offset on the rear by a pair of round-edged black plastic triangles. The top triangle holds the tablet's camera and 3G antenna, while the lower one acts as a well-disguised removable back plate, enabling easy access to the SIM card and microSD slots. A well-styled and manufactured device, the Orange Tahiti offers no bend or flex when put under extreme pressure, and has no unsightly seams, joins or construction blemishes. The only form tainting to this otherwise impressive design is the volume control button, which sits loosely in its mount and rattles on occasion when moving the device. It boasts mini HDMI and micro USB connection ports as well as the standard power and 3.5mm audio jack connectors. Far from the thinnest tablet on the market, the Orange Tahiti's 10.5mm thick, softly curved-edged body and 400g weight combine to make a tablet that is extremely comfortable in the hand. The 7-inch form ensures that the tablet can be held and carried in one hand with no uncomfortable or nagging wrist ache, even after hours of continued use. More than just a pretty package, the Orange Tahiti features a bevy of high-end innards that in some cases far exceed the expectations of a device crafted specifically for a network provider. 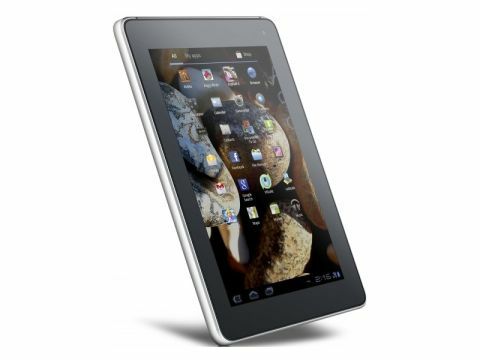 Thanks to a 1.2GHz dual-core CPU, the Orange Tahiti packs a hefty processing punch, more powerful than the 1GHz dual-core offering found in the iPad 2 yet still slower than the 1.4GHz monster residing in its more direct rival, the Samsung Galaxy Tab 7.7. Some 8GB of internal storage sees the Orange Tahiti sport the same amount of inbuilt content space as the currently US-exclusive Amazon Kindle Fire. But, unlike the 7-inch Amazon tablet, the Orange Tahiti enables you to expand the storage offering through microSD cards up to 32GB in capacity. With Wi-Fi and 3G connectivity options as standard, the Orange Tahiti further boosts its connection capabilities with the inclusion of GPS and Bluetooth 2.1.